Designed for capacity and best-in-class performance, the Pilatus PC-12 executive aircraft has earned a reputation for outstanding reliability and safety, making it the best selling pressurized single-engine turboprop aircraft in the world. The Pilatus PC-12NG aircraft feature custom interiors designed by Bespoken New York. View the slideshow to take a peek inside the plane. When on board, one quickly realizes the Swiss-built PC-12 was engineered for safe passage even in the roughest of Alpine weather. It’s easy to settle into the reclining seats and comfortable privacy. USB plugs and worktables complete an ideal place to get some real work done. Our third party operating partners utilize pilots that have flown thousands of passengers on commercial, military, charter, and private aircraft. These pilots have an unwavering commitment to safety, and passion for genuine personal service. All of the Captains hold an airline transport pilot certificate, and we require that our third party operators always fly with two fully trained, experienced pilots in the cockpit. 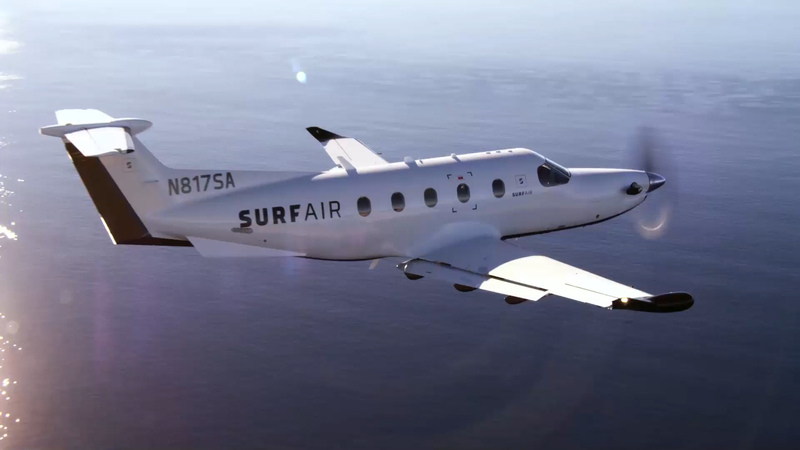 While the FAA only requires a single pilot to operate our aircraft type, Surf Air requires our third party aircraft operators to utilize both a Captain and First Officer on all flights. You can then rest assured that your flight crew will include a seasoned ATP-rated Captain and an experienced First Officer with an FAA commercial license. We require that our third party aircraft operators maintain all of our planes to the most rigorous standards, conducting regular mechanical inspections on each aircraft as well as comprehensive pre-flight checks before every trip.